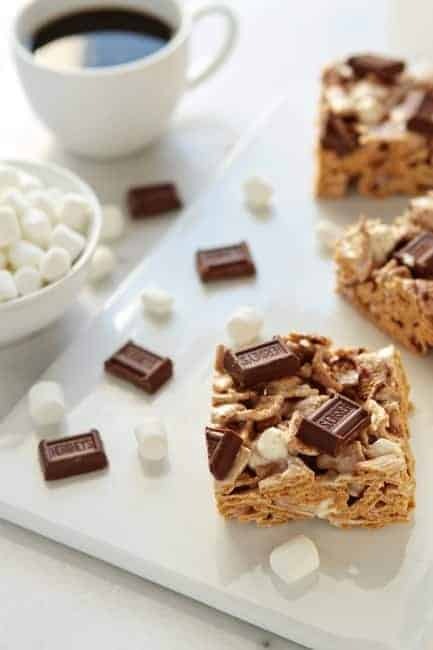 Golden Grahams S’mores – a delicious and simple combination of Golden Grahams Cereal, mini marshmallows and milk chocolate. If you read MBA on a regular basis, you may remember me discussing my new position at work. One of the duties of this new position is heading up The Box Tops for Education program. In case you’re not aware of the program, it’s one of the nation’s largest school fundraising loyalty programs and has been helping schools succeed since 1996. So far, America’s schools have earned over $525 million from Box Tops. You basically clip small Box Top coupons from over 240 participating products such as Ziploc, Cheerios, Betty Crocker and Land O’ Lakes. Schools collect the coupons (each is worth 10¢), count them up and turn them into Box Tops for Education. In return, Box Tops for Education provides the school with a check to purchase whatever they need most, from books to field trips to playgrounds. We’re using ours to fund our school store, which is part of our Positive Behavioral Interventions and Supports program. You might also know that I’m pretty OCD, so I’ve spent many of hours expertly clipping perfectly shaped Box Tops and meticulously stapling them to the submission forms. Sounds monotonous, right? IT IS! I’m fairly certain that I drive the school secretary crazy with the daily, over-dramatized clicking of the stapler. While checking out the Box Tops Facebook page for updates and sweepstakes, I stumbled across a recipe for Golden Grahams S’mores, which immediately made this pregnant girl overly excited. I’ve been kind of addicted to both Golden Grahams and S’mores while pregnant and couldn’t believe I hadn’t thought of this combination before. Eric was just about as excited as I was and made a special trip to the grocery store because a.) he’s amazing like that and b.) we were almost out of Golden Grahams. 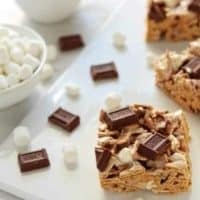 Golden Grahams S’mores bars come together in minutes and inhalation might better describe our first taste of these bad boys rather than the more common word – eating. I think you guys are going to adore them! Oh, and if you happen use items with Box Tops and aren’t currently donating them to a school, we would be happy to take them off of your hands – heck, I’ll even clip them into perfectly shaped rectangles for ya! Butter a 9 x 13 x 2 inch baking pan. In large saucepan melt butter over low heat. Add in 5 1/2 cups of marshmallows and stir until completely melted. Remove from heat and stir in vanilla extract. Gradually add in Golden Grahams cereal; stirring until well coated. Fold in the remaining 1 cup of marshmallows and milk chocolate chips. Using buttered spatula, press the mixture into the prepared pan. Gently press miniature Hershey's Bar pieces into the top of the bars. Cool in the refrigerator for about 2 hours. Cut into 2-inch squares. Store Golden Grahams S'mores Bars covered in the refrigerator for up to 3 days. 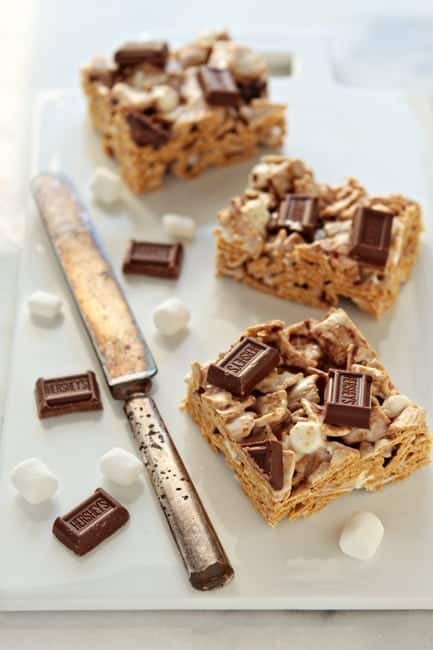 I’ve made a s’mores puppy show using golden grahams cereal, I’ll have to try this too! You are so cute — Jon David’s school has a competition each month for the class that brings in the most box tops. The winner gets pizza. So of course…I am always sending in box tops!! Such a cool program. And I LOVE these bars!! Did your cereal stay crispy? Mine got soft and leathery. Not very appetizing. First off, your pictures are gorgeous! Secondly, I clip box tops for my nephew’s school all the time! It’s a great program! I looooove the look of this!! Well this is timely. I was just saying yesterday that although I don’t think I’ve tasted a golden graham since I was ten years old, I suddenly had a mysterious craving for the sugary little things. Hmm. And now this recipe . . . well, I think a trip to the grocery is in order this morning. Yum! P.S. So excited for your little one on the way!!! Yes! Please stop back and let us know! Have a fantastic day! I LOVE Golden Grahams! I’m really sad that I can’t get them in Italy! Will be trying this recipe out when I’m next in the UK! I LOVE golden grahams! Can’t wait to make these!